Writable surface for listing contents and date. For use with freezer paper. When magnets and whiteboards become one Here at Houseables, we appreciate when the suffix -able is accurately attached to the end of a word used as a product descriptor. It is in our namesake, our business model, and very core of every product we provide. Two everyday items that have always met the -abled mark are magnets and dry erase whiteboards. A staple in classrooms from grade school to University; offices, warehouses, and kitchens, both items are universally used. If only someone had the ingenuity to combine these two small wonders and create a super tool that was half magnet, half whiteboard and the next organizational marvel... And here we are. Houseables' dry erase magnetic tape rolls add -able to some of our favorite verbs: customize, reuse, and depend. 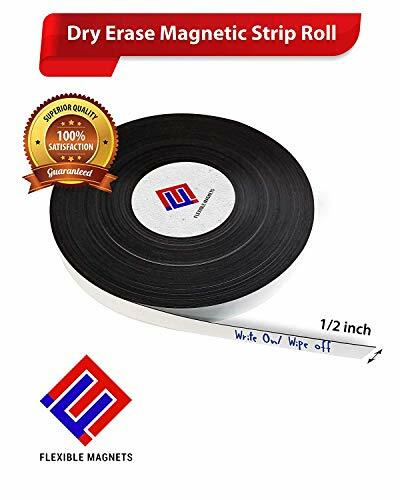 Unlike ordinary adhesive tape, magnetic backed tape applies and removes from flat surfaces cleanly, leaving behind no damage, residue, or gunk that you end up scraping or scrubbing away. Moreover, it less messy than post-it notes, which tend to pile up everywhere and inevitably end up in the garbage. Dry erase magnetic tape is a very clever and (more importantly for you) cost effective tool for labeling storage shelves, toolboxes, file cabinets, refrigerators, retail signs, and literally every other magnetic surface you can fathom. Use it for stockroom shelf labels, menu boards, retail signs, factory and office production schedules, classroom teaching aids, message boards, planning boards, tracking your weekly events, various arts and crafts projects, and so much more. INSTANT WHITEBOARD SURFACE: Create your own fully functional dry erase whiteboard on any flat magnetic surface. Easy to unroll, cut, apply, reposition, remove, and reuse. It is a clever concept for labeling and organizing a huge variety of areas at home or in the workplace. THREE WIDTHS AND TWO LENGTHS: Houseables' magnetic rolls are available in 1 x 25', 2 x 10', and 3 x 10' rolls with .02mm thickness. The look and performance of all three variations are identical, so each option gives you a glossy white board front and a strong magnetic backing that smoothly bonds to magnetic surfaces without the dreaded edge curls. Choose the roll that best fits your project needs. SMOOTH, HIGHLY VISIBLE WRITING: With any water-soluble dry erase marker, you can write smoothly onto the glossy whiteboard front. The marker dries quickly and erases cleanly with a simple paper towel or clean cloth (or even with your hand), leaving little residue behind, so you can rewrite on the surface repeatedly without issue. The surface is also suitable for Sharpies for permanent marker labeling. EASY TO CUSTOMIZE: Cut even strips from the roll using ordinary household scissors or a utility blade. Our dry erase rolls have a long lasting hold but is easily adjustable. Sticks and peels repeatedly without the magnetic backing losing its holding power. Stays firmly onto surfaces ranging from warehouse storage racks to kitchen refrigerators. Our new tape rolls are destined to become an instant hit for labeling, categorizing, organizing, scheduling, crafting, list making and...a lot more. COORDINATE AND REGULATE: With Houseables' magnetic tape roll, you can organize to your heart's content. Label away in your pantry for maximum cooking efficiency. Designate bins for storage around the garage. With this practical tape, you'll never misplace anything again.
. The XFasten Dry Erase Tape is a reliable marking tool that is compatible to all dry erase markers. It does not erase or rub of unnecessarily. When the markings are erased, it does not leave air bubbles or ghost markings, making it fresh, ready and new-looking to accommodate new markings and reminders. Overall, this elegant and premium looking tape allows teachers, kids, parents and office workers to post about reminders and other important details quickly while on the go. 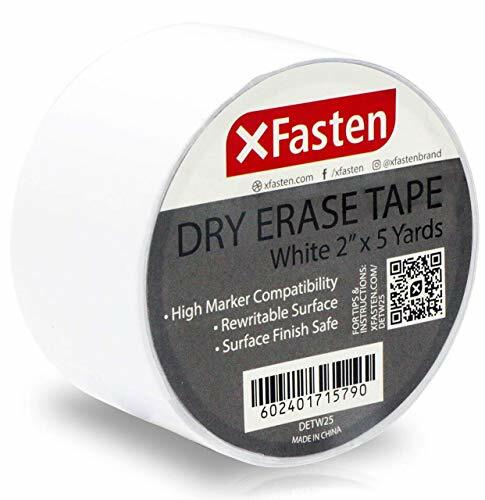 What Makes the XFasten Dry Erase Tape Different From Other Brands? Why Choose the XFasten Dry Erase Tape? Here at the XFasten store, we can assure you, our valued customer that we truly care for your satisfaction and happiness. We are just an email away should you have any concerns or inquiries. We also prioritize Quality Assurance and product development over mass production, so you can be assured that the roll that you are getting was carefully crafted and has gone through stringent tests before we decide that it is worthy to be used by your special intended purpose. 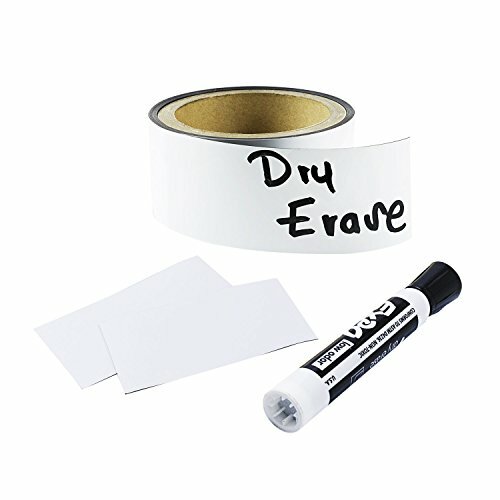 Reliable dry erase tape that resists smudging and ink does not erase or rub off unnecessary when written over by the marker or touched accidentally by the hand. Compatible to all dry erase markers and pen. Does not smudge messily and surface is smooth and glossy yet still yields the familiar satisfaction of feeling like writing over normal paper. Does not leave ghost markings if you need to erase what you previously wrote to post another to-do list or reminder. Reliable adhesive allows easy installation and prevents unnecessary curling and clumping in the hands. Can be removed and re-positioned without leaving any sticky residue. Tears easily making it perfect for posting dry erase sentence strips, reminders, to-do-list, quick notes, party games, temporary letters, custom labels and even provides a good brainstorming chance to users. Adheres well to cement, tile, marble, plastic, metal surfaces, leather, textile and wood. Glossy surface finish creates an elegant and premium feel making it fresh and looking new every time its markings are erased, ready for another round of reminders. Prevents air bubbles from locking in between the adhesive and the surface. Creates high contrast and extremely readable markings even from a distance, does not yellow out over time, UV and moisture resistant making it perfect for teachers in the classroom, parents, students, kids, name tags, on-the-go people that need quick reminders that does not take much time, business professionals and DIY project lovers. 3M Micropore Paper Tape is a general purpose paper tape that is gentle to the skin, conformable, hypoallergenic, very porous and breathable. 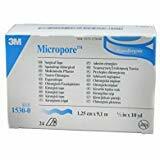 Micropore Paper Tape is generally used to secure dressings, to tape fragile skin such as facial dressings, elderly skin, and surfaces requiring repeated tape applications. Micropore does not contain either natural rubber latex or dry natural rubber. Step up your organization and labeling projects with ChromaLabel's Three Quarter Inch Color-Coding Labeling Tape! These colorful rolls of tape are suitable for countless applications -- whether you're a teacher making a custom chart, clerk filing important documents, company prioritizing tasks, or an aspiring artist creating a craft project with a burst of tasteful color. Writing on the tape with a felt tip marker allows you to further expand your usage options for pricing, custom identification, or initials on a special treat you wish to keep for yourself. Pressure Sensitive Adhesive of the multi-use tape ensures that it will stay just where you need it, and will have maximum adhesion to a clean, flat surface. However the tape can be removed without leaving residue on most surfaces. As with most self-adhesive products, the longer the tape is left to set, the more permanent the bond will be. The optimal temperature range for this product is 40 - 200 F. The Five hundred inch long rolls are finished on a sturdy one inch core and cleanly shrink wrapped. Mix and match colors options to ensure you'll be able to lend your signature touch to many projects. Professional or DIY, at school or home, color-coding or just having fun -- take your project to the next level of style and function with 3/4" Color-Code Labeling Tape from ChromaLabel! Gentle to the skin, conformable, hypoallergenic, very porous and breathable. 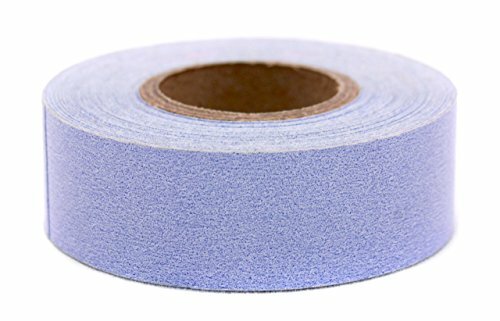 Generally used to secure dressings, to tape fragile skin such as facial dressings, elderly skin, and surfaces requiring repeated tape applications. Does not contain either natural rubber latex or dry natural rubber. 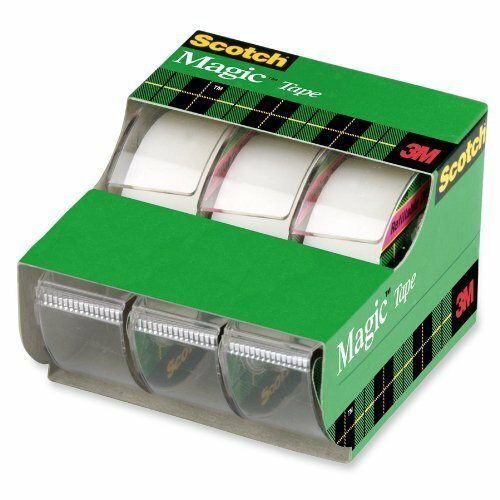 This 3M 3105 Scotch Magic 3/4" x 300" transparent write-on invisible tape with dispenser makes it easy to wrap packages and mark boxes! Both convenient and versatile, this invisible tape comes with a dispenser with a blade that ensures easy cutting of the desired length every time. Plus, its transparent, invisible form makes it virtually unnoticeable once applied to items, allowing you to use it to mend important documents that have been accidently ripped or torn. This tape pulls off the dispenser easily and has a write-on surface for simple labeling. It accommodates pen and marker inks, as well as pencil lead. This tape and dispenser are sure to be the ultimate, go-to supply for any office, school, or day care facility. 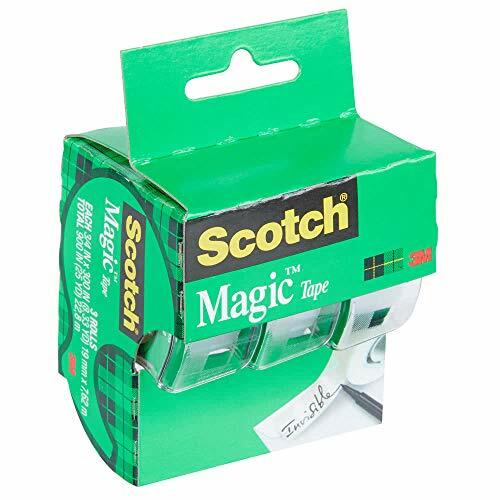 Scotch Magic Tape, 6 Pack, Length: 300" Width: 3/4"
The XFasten Invisible Magic Tape is simply one of the best office and home documentation and wrapping tape there is on Amazon. 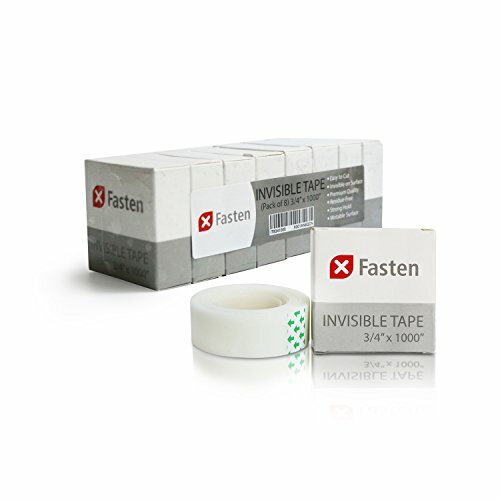 We have asked our customers as to what features they need for an invisible tape and incorporated everything in the XFasten Magic Invisible Tape. This is the perfect tool for note taking, document marking, mending and wrapping. What Makes it the Best Invisible Tape on the Market? -Subtle and Invisible on copiers, making your notes written in it clear and crisp on copies. -Does not tear, curl or split unnecessarily but is easy to cut, making it convenient to use for fast paced documentation. -Matte finish, making it easy for you to write using a ballpen, marker or pencil without the fear of smudging. -Labels written on it stay permanently and does not fade in the long run. -Excellent adhesion but does not damage paper and cardboard surfaces when you need to reposition or remove the strip. -Comes in a pack of 8, giving you the best value for your money. -Professional and neat giving your documents a clean and minimalist look. -Designed by our Research and Development Team through the initiative of our consumers' suggestions on which specs should the Invisible Tape have. 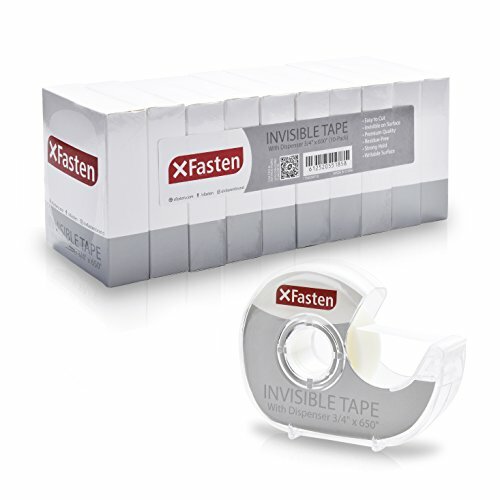 The XFasten Magic Invisible Tape is a perfect tool for many offices and homes as it is designed for teachers, office workers, document controllers, DIY lover and any person who is in the business of documentation and note taking. Asking from a pool of over a thousand Amazon customers, we have gathered the inputs of our very consumers in order to create a tape that is bent on satisfying the requests of our buyers. This is a tape made by you, for you. Subtle and Invisible. Perfect Tape for Gift Wrapping. Matte-finish magic tape that is frosty in the roll but invisible when applied to paper, memos or photos. Perfect for Labeling. Writable smudge-free surface either through pen or pencil making it an ideal note-taking and bookmarking tool on office documents. Professional Grade. Clear tape surface does not show on faxes, scanners and copiers- perfect for sealing envelopes, label protection and mending torn documents. Convenient and Easy To Use. Resists Splitting, curling, unnecessary tearing within the roll, and is easy to handle, cut and apply. Comes off the roll smoothly and is tough enough to be managed easily. Photo and Paper Surface Safe. Excellent adhesive holding power but is photo safe and will not damage paper, documents, folders or photo surfaces. Decorate and personalize your projects. Elegant matte finish. Write on it with pen, pencil or marker. Features a unique adhesive that holds paper securely. Works great with Scotch desktop and handheld tape dispensers. 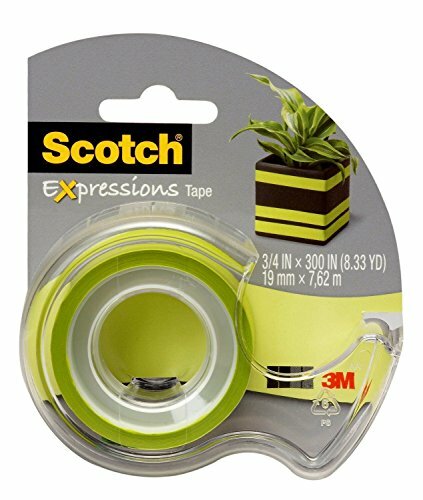 Tape Type: Transparent Adhesive Material: Acrylic Width: .75amp;quot; Thickness: 2.2 mil. Bring out your creative side with the new LolliZ decorative Washi Tape sets. Each of our 12 colorful sets features six eye-catching patterns that you can use to decorate just about anything your heart desires. Add a splash of color to scrapbooks and gift wrapping, visually organize folders and calendars, and invent countless new ways to use this versatile and eco-friendly tape. Washi is decorative paper first made in Japan over a century ago and used for many cultural and artistic purposes. In recent years, rolls of adhesive tape made from the paper have become enormously popular, not only in Japan, but all around the world. Similar to masking tape, it can be easily removed shortly after being applied, but may become more permanent the longer it sticks to a surface. Our Retro Chic set features six individual rolls of Washi tape, each with decorative vintage patterns and retro colors from yesteryear. Use it to design unique party invitations, mark special events on your calendar, decorate picture frames, bulletin boards, gifts and so much more! The Retro Chic Washi Tape Set is one of twelve beautiful collections that are available from LolliZ . All of them make wonderful gifts, enjoyable by creative adults and children alike for their varied uses. We are so sure that you will love this versatile tape that it comes with the LolliZ 100% Satisfaction Guarantee. 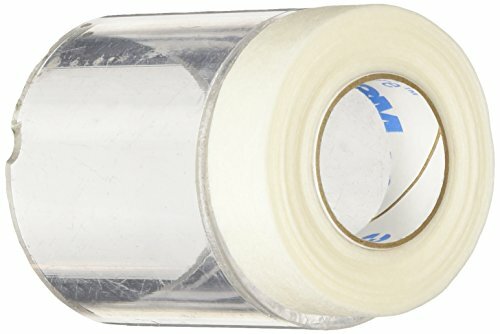 The XFasten Invisible Magic Tape is simply the best and most cost-efficient office and home documentation and wrapping tape there is on Amazon. We asked our customers as to what features they need for an invisible tape and incorporated everything in the XFasten Magic Invisible Tape. This is the perfect tool for note-taking, document marking, mending, and wrapping. It comes with a jamming-resistant dispenser that allows for quick dispensing and cutting of tapes, giving you more mileage over time and even cutting the time and effort required for packing or taping documents, crafts, school projects, and gifts. Why Should You Have The XFasten Clear Tape with Dispenser? Subtle and Invisible on copiers, making your notes written in it clear and crisp on copies. Does not tear, curl or split unnecessarily but is easy to cut, making it convenient to use for fast-paced documentation. Matte finish, making it easy for you to write using a ballpen, marker or pencil without the fear of smudging. Excellent adhesion but does not damage paper and cardboard surfaces when you need to reposition or remove the strip. Strong enough to seal documents, protect labels and mend accidentally torn documents. Invisible and matte-finish clear magic tape that is FROSTY IN THE ROLL BUT MERGES WELL when applied to paper, documents or gift wrap. Comes with a quick-and-easy to dispense and jam-free dispenser. 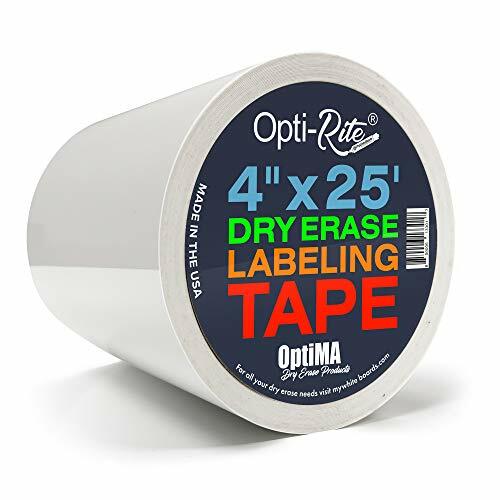 This invisible tape with dispenser does not turn yellow over time, allowing you to see clearly the text, logo or barcode that is printed beneath the applied 3/4-inch magic tape. Appears invisible on faxes, scanners and copiers. Ideal for mending documents, notes, sealing envelopes and packing gifts. The portable dispenser operates smoothly without any jamming, ensuring a quick and effortless operation. Precisely engineered magic tape fibers that resist splitting, curling, shredding, sticking and unnecessary tearing in the roll making it extremely manageable, easy to handle and apply. Acid-free, photo paper and archival safe, making it compatible with delicate documents as it does not damage paper documents or wash away colors from photos. Subtle and seamless on gift wrappers, making this a perfect gift wrap tape. Chalkboard Tape Set -- 2 Chalkboard Writeable Tape Rolls -- Green Chalk Tape Roll (1/2" x 50 Ft.) -- Black Chalk Tape Roll (3" x 15 Ft.). Includes two rolls of chalkboard tape. 1 black chalkboard sticker roll (3 inches wide, 15 feet long). 1 green chalkboard roll adhesive (0.5 inches wide, 50 feet long). Perfect for making chalkboard labels stickers! Chalkboard tapes are black and green, and adhere to clean smooth surfaces. Perfect for home or work. Elevate your next DIY project straight to amazing by adding details using these rolls of Chalkboard Tape! Chalkboard tape is the hottest new trend in crafting. This chalkboard adhesive tape set is perfect for office projects, wedding crafts, home organization and more! Everything you need to enhance your scrapbook projects and everyday items. Chalkboard Tape Set -- 2 Chalkboard Writeable Tape Rolls -- Green Chalk Tape Roll (1/2" x 50 Ft.) -- Black Chalk Tape Roll (3" x 15 Ft.). Includes two rolls of chalkboard tape. 1 black chalkboard sticker roll (3 inches wide, 15 feet long). 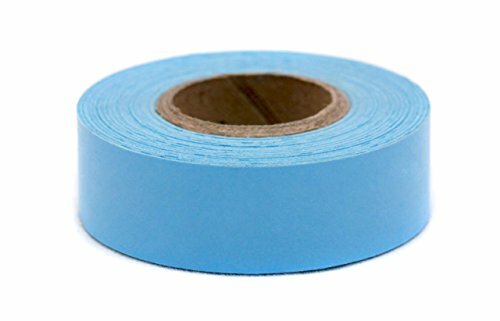 1 green chalkboard roll adhesive (0.5 inches wide, 50 feet long). Perfect for making chalkboard labels stickers! Chalkboard tapes are black and green, and adhere to clean smooth surfaces. Perfect for home or work. Elevate your next DIY project straight to amazing by adding details using these rolls of Chalkboard Tape! Chalkboard tape is the hottest new trend in crafting. This chalkboard adhesive tape set is perfect for office projects, wedding crafts, home organization and more! Everything you need to enhance your scrapbook projects and everyday items. Magnetic strip roll makes maintaining your house and warehouse easier. Simply cut pieces of the roll and label them. We have a variety of sizes to choose from. SUPERIOR QUALITY- This magnetic tape roll possesses a smooth blank writing board and a magnetic back. You can write with enjoyment onto the glossy whiteboard front. The marker writes smoothly and erases easily. 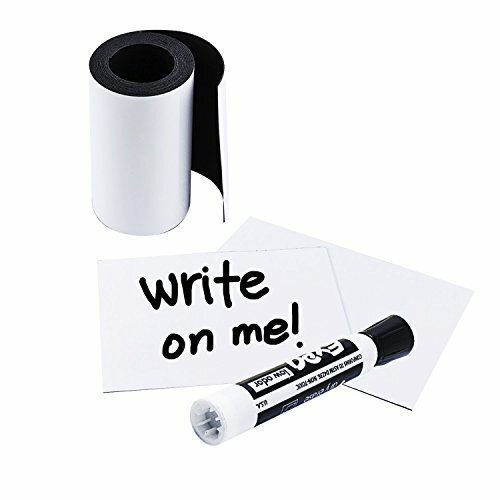 VERSATILE USE-It's great to use for writing messages, notes on the refrigerator or in your job. It's also fantastic for labeling and organizing at home, workplace or file cabinets. VARIETY--Choose from different options of magnet Width to suit your every need! See chart for more details. EASY USE- Easily adjusts to size. Just peel & stick, it's that simple to use! Will not leave residue! 100% SATISFACTION GUARANTEED! Fast Free Shipping! . Frosty on the roll but invisible on paper, Scotch Magic Tape features the original matte-finish design for a strong hold and seamless look. 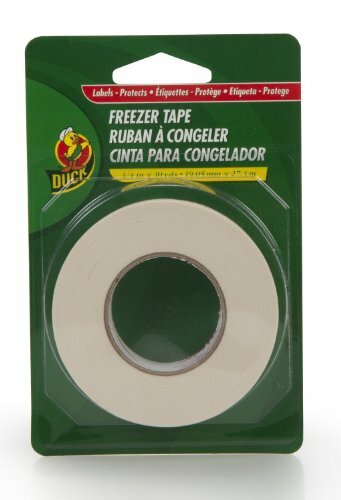 This tape pulls off the roll and cuts smoothly, resisting splits and tears for a sturdy piece. Thanks to its gentle adhesive, you can stick then re-stick each piece as your project demands, then jot a helpful note with a pen or pencil on top when you're done. Write on it with pen, pencil or marker - Photo safe and made in USA. You can get more fun from these amazing washi tape. 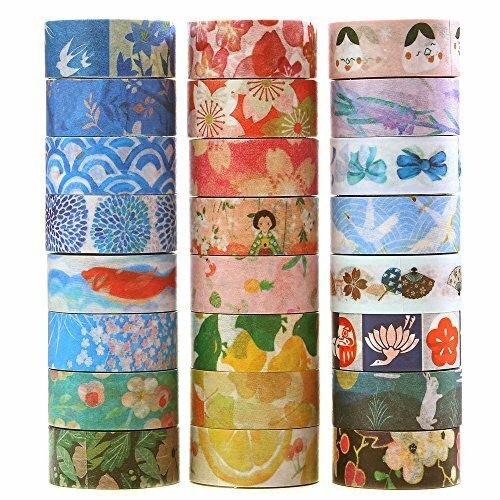 24 Large Pack Tapes - There are 24 washi tapes in different patterns . They are 4m in length and 15mm in width. Full of Creative Idea - our washi tapes are beautiful, colorful patterns, they have multiple usage and good stickiness. The quality is good so that you can use it in peace. 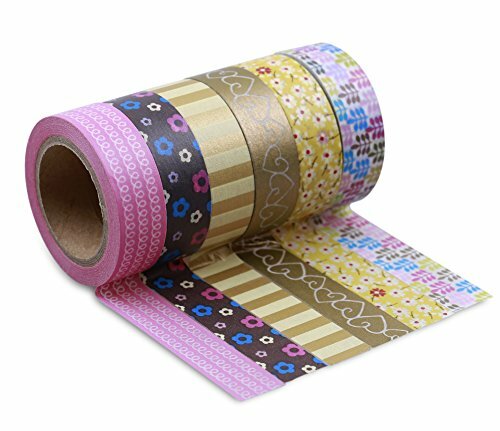 More Usage - About the usages of washi tape, you can find many different usages in your daily life. For kids, they can use it to decorate their pencils, textbooks and desk, ect; For the young, they can use it in bullet journal, planner and gifts,ect. For the old, they can use in playing with their lovely little ones. Distinctive Patterns - The festival series for 24 washi tapes. It means that you can receive 24 different washi tapes in the patterns about festival series. It can satisfy your different demands for any using situation. Unusual Washi Tape Set - The great quality and special patterns of washi tapes could gain the one's favor who have used them. Perfect for labeling food containers, storage bins, lockers, cubbies, and so much more!